The first time I saw the quaint practice of political sign-waving in Hawaii, I almost wrecked the car. I was tooling down Hana Highway ready to round the corner up to Haleakala Highway, and a group of nutty people were by the side of the road, waving signs, leaning in toward my car and generally making a nuisance of themselves to an unsuspecting driver. The next time I saw them was on the other side of the road in the morning on my way to work. Once I slowed enough to read the sign I thought this was perhaps a rogue political candidate who had come up with a way to make himself stand out in the crowd. But no, this is business as usual for politicians in Hawaii. You can view it on you tube at http://www.youtube.com/watch?v=CZRMHa1jQnk in relation to safety concerns raised. And I think it does slow traffic down. “I have a theory about why we get the political leaders we get. It is because of sign waving. What is it that takes the normal, akamai, pleasant Hawaii citizen and turns him or her into the perennial lei-wearing, egomaniacal, self-promoting politician capable of raising your taxes, sewer fees and bus rates while cutting government services, shutting schools on Fridays and skulking around the state Capitol and City Hall? It’s those hours out in the sun and traffic, I tell you. First they have not the sense to stand back from the traffic. The sign wavers are right on the curb, the signs are out into the traffic and they are waving frantically. Herbert A. Sample / Associated Press, said: “Unlike most of the country, it is against the law in Hawaii for politicians to plaster their faces, names and slogans on billboards or utility poles. It is a decades-old, low-cost tradition that has been replicated in few other places in the U.S., at least to the extent that Hawaii politicians do it. “I’m not sure if sign waving actually causes anybody to vote for a particular candidate,” said Honolulu Councilman Charles Djou. “But I will tell you that people won’t vote for a candidate if they don’t sign-wave,” he added. Ed Case, in regard to his 2010 campaign, said that because he was out before dawn, voters could witness a measure of his commitment, character and hard work. “It’s not the be all and end all, obviously, of a campaign, but it’s an important part of it,” said Case while sign waving along an eastern Honolulu thoroughfare. 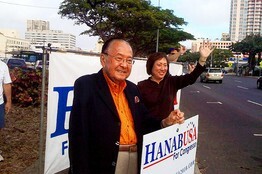 The practice has become a must-do for candidates, said Hanabusa. “I think that (voters) begin to expect it, and they are not surprised to see it,” she said while standing in front of her “Hanabusa for Hawaii” sign near a busy central Honolulu intersection. Our French visitors who were just here found the practice odd and laughed about it. It does have a way of making the candidate look like something of a baffoon. But then after a while it kind of grows on you. Hawaii is always surprising in the way it’s unlike anywhere else in the country, and the elections are no exception. Perhaps the most over-the-top sign waver was former state Sen. Steve Cobb, who would start sign-waving in the early morning darkness. To be seen, Cobb would wrap himself up in Christmas tree lights and plug himself into a portable generator. Good thing I didn’t see that one first, or I might really have wrecked the car. This entry was posted in Life in Hawaii and tagged A Maui Blog, Hawaii Tourism Board, hawaii tourism Bureau, How to move to Maui, Just another day in paradise, living on Maui, Maui Blog, Maui News, Maui Tourism Bureau, Maui Visitor, Maui Visitor's Bureau, Maui Weather Today, Mauidailyescape.com, move to Maui, moving to Maui, Political sign-wavers, Sign-wavers in Hawaii, travel, Travel and Events by jamaicawtr. Bookmark the permalink.